Building a new home involves more than selecting the perfect design elements. Here at Primera, we understand that every home buyer has a unique style, schedule and budget that will impact each step of the process, which is why we use VEO Design Studio software to ensure every dream home becomes a reality. What is VEO Design Studio? VEO Design Studio is an innovative online design workspace that brings together all aspects of home design to streamline the process for home buyers and designers. Within the VEO Design Studio, home buyers can browse their potential options of flooring, countertops, cabinetry, carpets, window treatments and more to simplify the selection process and maximize their design experience. They can even create a wish list of their favorite products and ideas to upload, save and share with designers, friends and family. How does VEO Design Studio work? A simple login using an email and password combination brings users to a main dashboard with several different modules. Here, they can view and compare products and materials, learn about product performance and care, manage their design appointment schedule, and even get tips on preparing for their next design session. The Option Pricing tool allows home buyers to compare different price points and design selections to help them stay within their budget. Working with their designer, home buyers can then make sure they fulfill their dream home must-haves without exceeding their predetermined budget plan. 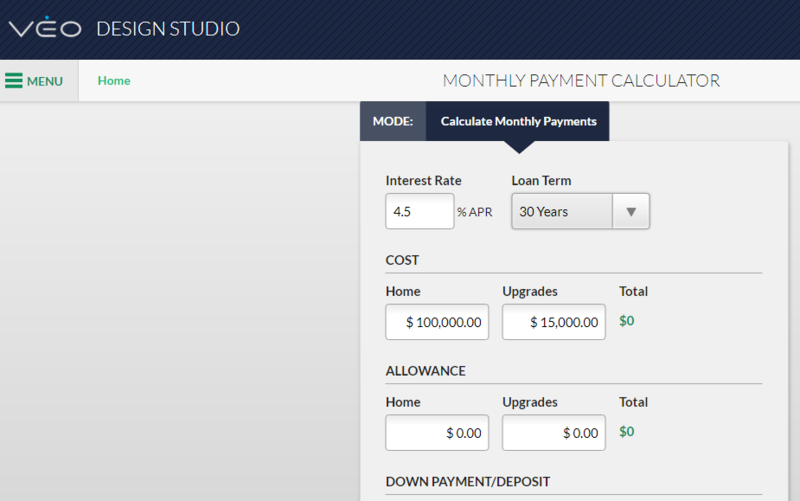 Home buyers can also use the Monthly Payment Calculator to help them stay on target with their budget and calculate how much they will save by buying through the design center. The VEO Design Studio also provides helpful worksheets and checklists to help home buyers prepare to meet with their designers. With Primera and VEO Design Studio, home buyers never have to go it alone. Building a new home—and navigating all of the choices that come with it—can sometimes feel overwhelming. Here at Primera, our goal is to make the journey from dream home to reality as simple and pressure-free as possible. Working with our experienced designers and using the VEO Design Studio tool helps home buyers organize their options, stay within their budget, make design sessions simpler, and ultimately bring their dream home to life.